5°C, negligible N breeze. Clear sky white dry salty roads. Commute with MapMyRide+! Distance: 25.08mi, time: 01:43:03, pace: 4:07min/mi, speed: 14.60mi/h. Strange encounter: the ride home took me through Weeford. Weeford has a short part climb which is a bit narrow. Tonight, a cyclist started the hill before me with a weave to the right. His bike has a big plastic bag hanging by the back wheel. I called ‘on your left’ so I could pass as he swerved right. But at the last moment, he veered left forcing me to swerve right. ‘Okay, on your right’ I corrected. Then, as I overtook, I said ‘good grief’. The guy is a hazard, mainly to himself, and to others. More incoherent shouting, the word ‘light’ came out. The shouting continued as I got to the top of the hill. Bizarre. It’s no good to me to discuss the matter, I don’t care what the nutter thinks. He’s probably plucking bits of his bag out of the rear spokes as I write. If he’s that annoyed then shut up, and get up the hill much faster. That wasn’t the only encounter tonight. On Rosemary Hill Road, I passed a guy with no lights of any sort. At least he wore a tabard, but otherwise- darkness, car headlights often don’t reach high enough. 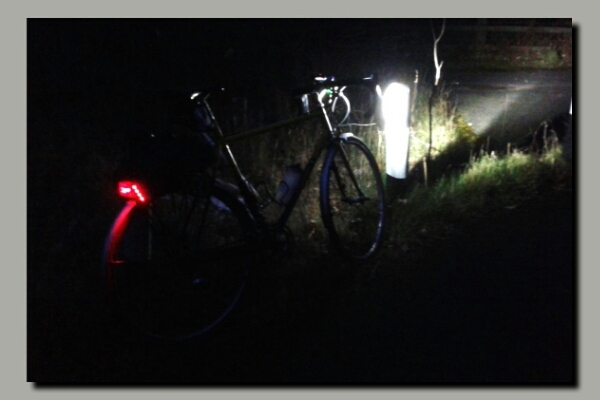 We stopped on a red and I said: ‘you ought to get lights,’ he said ‘I know’. Let’s hope he does. Nobody wants to pass a cyclist lying in the road with a coat over his face one night. This entry was posted in Commuting, opinion, Thinking and tagged Weeford. Bookmark the permalink.